Normally I would be perfectly happy with this: Flowering bulbs for most of the winter is a good thing, and a week or two between one finishing and another starting is perfect. But NOW, thanks to Carol and bloom day, I'm just frustrated that neither of them decided to bloom for the 15th! And with that: I've survived the last of the truely difficult bloom days -- next month, I should have crocuses, aconite, witch hazel, and snowdrops, and I'll be good until November -- and next winter, I'll be prepared. I'm going to force SO many bulbs next winter I won't have room in the fridge for anything else. Hooray for the houseplants, the African violets, kalanchoes and orchids, for they keep us sane in February! Happy GBBD! Love the violet. 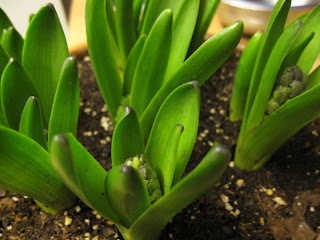 Forced bulbs have to be moved in and out from cool to warm to speed them up and slow them down, but I liked the pic of the hyacinths in bud. Promise of bloom is good. NellJean, good point -- I could have moved them into a warmer part of house to speed them up, but I like growing cool, as it seems to keep them more compact and less likely to flop all over the place! 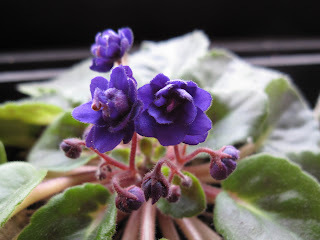 At least your African Violet was blooming and it is such a pretty color. Should we be adding charcoal to our soil? No, I don't need MORE copies of your catalog! That's it. I'm getting bees. Rice art and cultivar lust.